San Francisco–based artist John Chiara creates photographs with a handmade camera so large it must be towed on a trailer. The devices works like a camera obscura, box or room-like constructions that predate photography and are used to focus images on a wall through a small hole. While Chiara uses large, high-quality lenses, his process is similar to those used in the early days of photography. In Chiara’s case, the result is one-of-a-kind artworks that buck photography’s most unique trait while embracing the medium as a whole. We’re accustomed to the idea that photographs — unlike paintings — can be infinitely reproduced. However, the earliest photographs were one-of-a-kind images exposed directly onto a light-sensitive plate. Even though reproducible techniques were introduced early in the history of photography, unique photographs, such as daguerreotypes, ambrotypes and tintypes, remained popular for decades, before ultimately losing ground. There’s still something attractive in the unique image. Less popular than it once was, instant film was a modern fulfillment of this same desire. Chiara’s latest solo exhibition at San Francisco’s Haines Gallery, Lands End: California at Larkin, showcases 16 of his newest works. Though Chiara also has a new book, John Chiara: California, that features work taken throughout the state, Lands End focuses solely on works photographed between Pescadero and the Marin Headlands. To capture these one-offs, Chiara places large sheets of light-sensitive photographic paper inside the camera, where images are exposed directly onto the paper. With this process, Chiara creates unique objects that can never be duplicated, only approximated (like the images accompanying this article). And though the digital images interspersed here may appear to be high quality, the originals are stunning in their clarity. Indebted as it is to traditional photography techniques, Chiara’s work is particularly impressive because it is not retro. His photographs aren’t novelties or throwbacks, nor should they be, since at their essence they are simply impressions of light. Half of the work in Lands Endwas shot on negative paper, which reverses the order of light and dark areas. Paper negatives were patented in 1841, but most people only see negatives (film or paper) at very small scales or in a darkroom. With photographs as large as 50-by-35 inches, Chiara reveals to viewers the normally hidden nature of negative paper. Several photographs were taken in downtown San Francisco, but exhibit a serenity that sometimes escapes these locations, perhaps due to the fact that they contain no people and no cars. Because of the reversed order, they appear to have been taken during some apocalyptic night, rendering the serenity a bit disquieting. As negatives, these images also highlight features that might otherwise be taken for granted: The dark ladders of a fire escape, an ordinary feature of the environment, become a focal point of a photograph taken at Larkin and McAllister Streets. 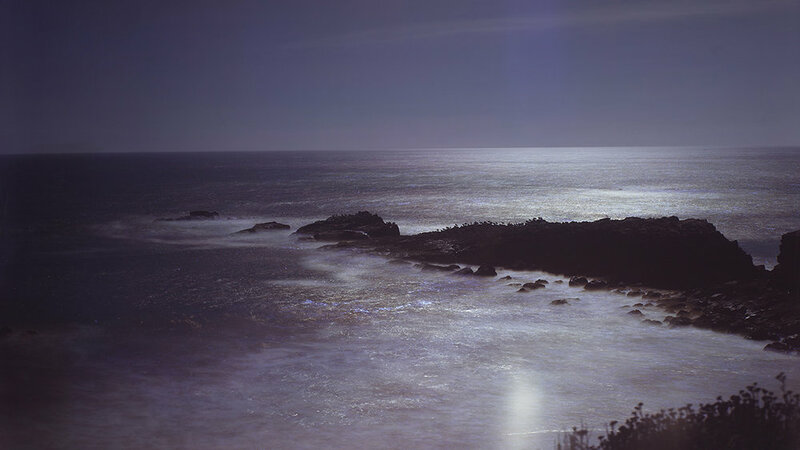 The remaining half of Lands End is a series of photographs exposed on Ilfochrome paper, which is normally used to print from transparencies. Unlike the other work, this process results in positive photographs that more closely resemble reality. Most of these are photographs of the Pacific coast in San Mateo County, and the ocean presents Chiara with an opportunity to experiment. In many 19th-century photographs, moving water looks something like liquid mercury because longer exposure times flattened out the movement captured by the camera. Chiara wondered if instead he could render the ocean like a painters does, with the luxury of presenting something more impressionistic. By interrupting the exposure dozens of times by very briefly obstructing the lens, Chiara creates a sense of movement that is neither negated by long exposure or frozen in time by short exposure. The ocean in his Rockaway Beach photographs is indeed painterly — from a distance its subject matter is undeniable, but upon closer inspection viewers see something that never really existed, a composite of multiple instants rendered as one impossible moment. The ocean looks like a whirlpool of activity. Chiara’s dark, sometimes underexposed, photographs of the ocean harken back to the medium’s history, especially to the many photographers who were drawn to Northern California’s rocky coasts. But it’s unlikely that most 19th-century viewers would have seen anything like Chiara’s photographs. In that era, 18-by-22-inch photographs were called “mammoth.” Only in the rarest cases were photographs ever as large as Chiara’s, which also benefit from modern photographic paper. Chiara’s practice has one foot in the past without being nostalgic. A sincere interest in traditional methods builds upon that legacy to create something new. Unique photographs and direct exposure on paper happen to be a part of photographic history, but there is nothing outdated about them.